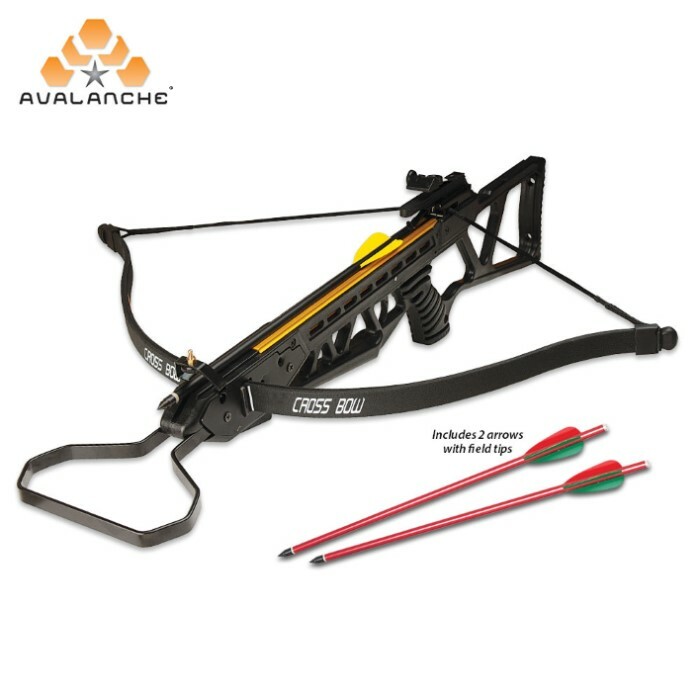 Avalanche Tactical Crossbow - 120-lb Draw Weight | BUDK.com - Knives & Swords At The Lowest Prices! 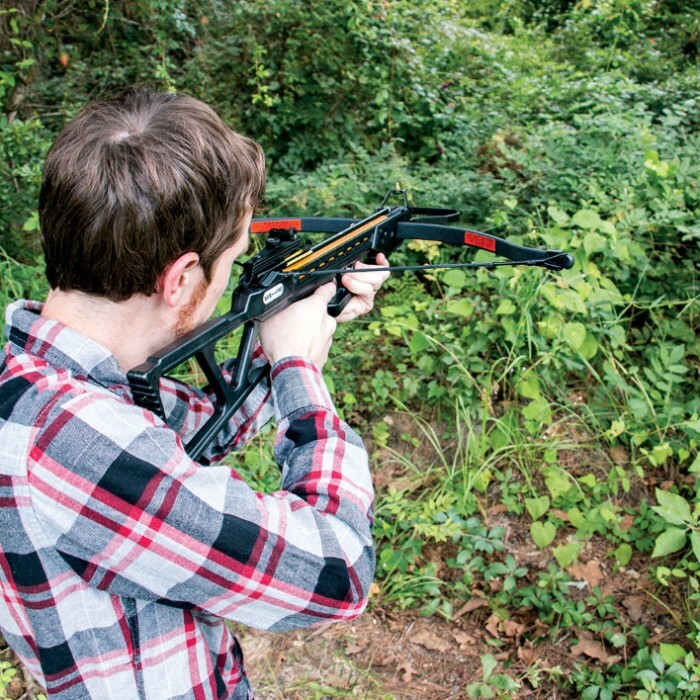 This 120-lb Avalanche Tactical Crossbow is great for hunting and target practice. It has a black synthetic stock with an aluminum inner frame. It yields a 120-lb draw weight and a 11 1/2" power stroke. It shoots bolts up to 185 fps. It also features a mounting rail for scopes and red-dot sights. Includes two 14" aluminum bolts. I just bought two of these for my nephews, for Christmas. They have not been assembled or used yet but they are good looking and appear to be of good quality. The price is unbelievable! I can't wait till they get to assemble them and use them. These will be their first crossbows, and should bring them many years of use. I bought another one two years ago for my stepbrother, it was 150# draw and had a wooden stock. He loves it, and has used it many times with no problems, and it is deadly accurate. I highly recommend BudK crossbows, for their price and quality. They are a great way to be introduced to hunting with a crossbow at an affordable price, and do the same job as higher priced models found elsewhere. 5***** stars. Will continue to do business with BudK. Easy way to string xbow. Love it much nicer thn i ever expected. Ive bought a ton of stuff from here definitely best item ever. Everyone has a hard time stringing crossbows. Easiest way is wrap a ratchet strap around one limb then under the but (prart yourest against shoulder) then around other limb and crank till string pops on. Do not over crank. Been doin this way for years. Hope it helps. Rachet straps are cheap $12 for 4 sometimes less. Good luck be safe. This is an amazing product for the price. Assembly wasn't hard to figure out with the terrible instructions. Shoots high out of the box, but once sighted properly it hits targets like a pro. Very powerful, first bolt went through my target and two inches deep into my garage wall. Bolts that come with it are cheap 14 inch ones and will break easily, so glad I bought 12 extra bolts. Don't forget to purchase rail wax with this. Overall, this is an incredible deal you should not pass up, whether your an amateur and this is your first crossbow, or a pro looking for something to mess around with. I can not wait to get a scope, carbon fiber bolts, and razorback tips to hunt with this beast. This crossbow has serious power. As with a compound bow, shoot into a bale of hay or archery target not into plywood. The bolts are fine and work well with this crossbow. I bought 2 packs of 5, along with the 2 included gives me 12 bolts.Accurate and powerful. This is not a toy and has definite hunting power. If treated as an archer would treat a bow, meaning shoot into proper target and no dry firing, you will not be disappointed. Bow was alright but both bolts broke in the first two shots! I need to buy better quality bolts now! This is a great entry level crossbow. It hits hard and it's accurate. If you've been interested in trying out a crossbow this is the one to try!